Though climbing hills and roaming in forest was my hobby until I was 18, but I never did “trekking” in particular. 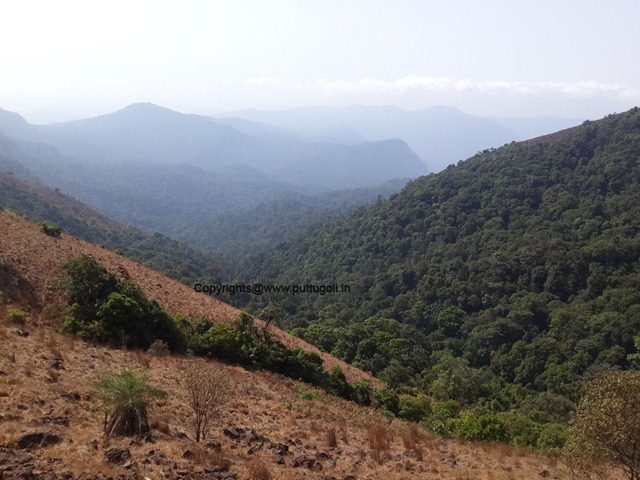 The trekking in Kodachadri hills was an wonderful experience. One of my friend and me planned for visiting “Kodachadri” and “Kollur Mookambika” on a weekend. We started from Bangalore on Friday night by Bus to Kollur. Usually all these busses to Kollur take Bangalore-Mangalore-Udupi-Kundapur-Kollur route. But this is not a correct route if we go by our own vehicle as the distance is more. Since the busses get more passengers I think they take this route. We reached Kollur around 8 A.M in the morning, freshen up and took some rest. Around 10.30 A.M. we went to temple, had wonderful darshan of “Mookambika”. I was very happy. We had stayed there until 12.30 Maha Mangalarathi (Maha pooja performed) and then had lunch in the temple. 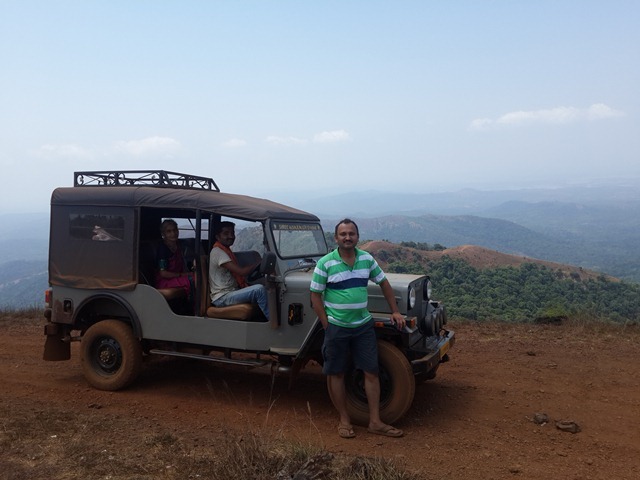 There are Mahindra Jeeps available “for hire” in Kollur for going to Kodachadri. They charge now around 2400 RS for 8 members (one trip up and down). We thought of going by Jeep but did not take from Kollur as the charge for two of us was too much. We then planned to go to the base of Kodachadri that place is called “Kattinahole” by bus. There are busses from Kollur to Shimoga and we have to get down at “Sampekatte”. From here again take an auto to reach “Kattinahole” (Auto charge around 200 RS). Here there are 8 Home Stays available. We can plan the stay appropriately if number of people are more and also can bargain the rate per person (Now they charge around 750 RS per person per day). We reached “Kattinahole” afternoon by 3.30 PM and were asking for some place to stay then somebody from nearby shop guided us to a person named “Mabla Bhat”. He took us to a Home stay “Akshaya Homestay”. Do not expect luxury. It is just a village house which they rent out for guests. They serve us a dinner and morning breakfast. No lunch. After freshen up in the evening we both thought to just go around and talk to people. We then walked around and reached the forest check-post. As we were talking to the guard at the gate we came to know that we can hire a guide for trekking. We actually thought of going by the road which the Jeep takes. But they said the road is dusty and is not good for walking. So we decided to hire a guide and start very early in the morning. 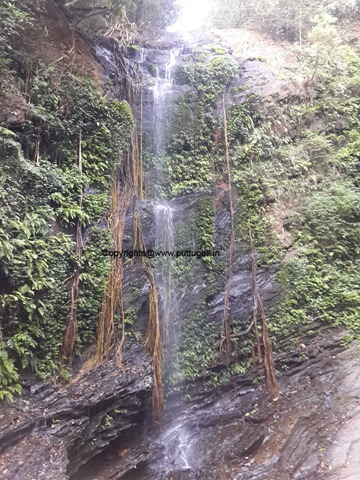 Our guide “Ganapa” (he was about 74 years of age but looked healthy) said it is better to take the route where we get the “falls” on the way. 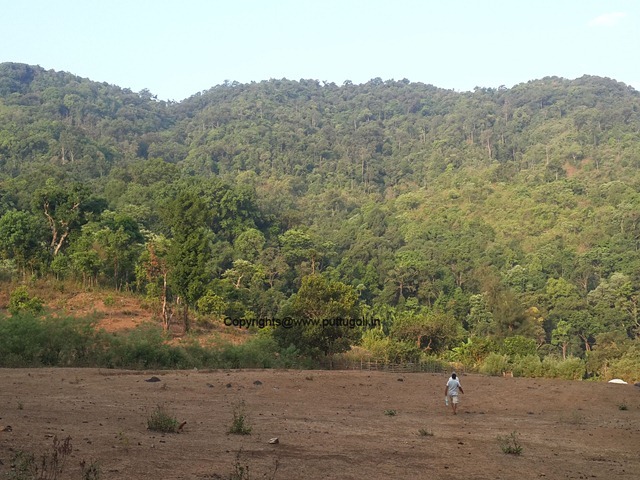 As the Sun went down the hills and darkness was covering we were stepping towards the “Akshaya Homestay”. It was cool night. No mosquitoes!! Morning it was cold too!! Starting point was passing by some paddy fields and village houses. There were jack fruit trees, mango trees and many other trees on the way. In the above picture we can see spring water that was very clear and tasty. Much more tastier than filtered water. 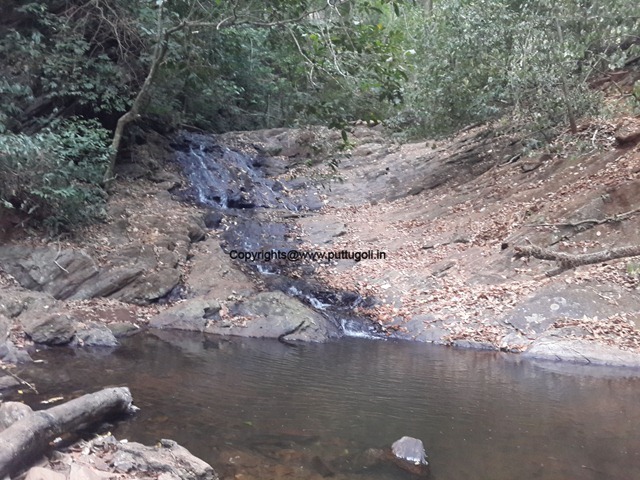 We then walked inside the jungle for about 4 KM to reach “Hidlumane” falls. Since it was hot summer, water was very much less but was ice-cold. We enjoyed taking bath in the falls. Our guide Ganapa was carrying “Paan” (Betel leaf and areca nut combined with tobacco). Along with him, both of us also consumed the “Paan”. It was a nice experience. Got some more energy and started climbing the hilly area with dense forest. 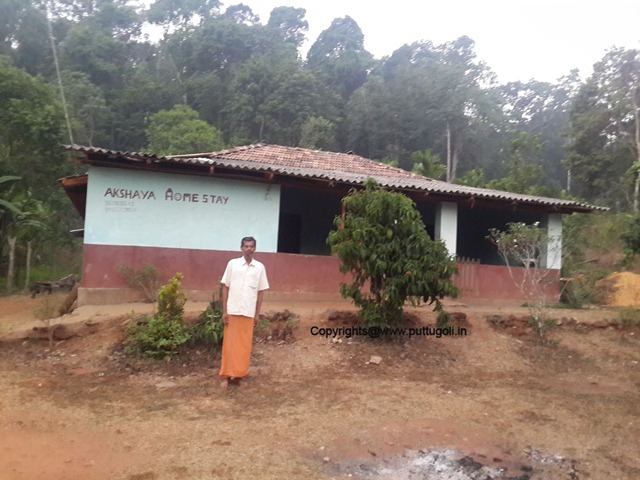 In the above picture, the first one is the house “Akshaya Homestay” where we stayed and person is “Mabla Bhat”, owner of the house. The second one is our guide “Ganapa”, 74 year old person but was very much healthy. Though we both much younger to him were puffing and panting to walk, he was energetic and not looked tired. Climbing the hill after a hill was not easy. 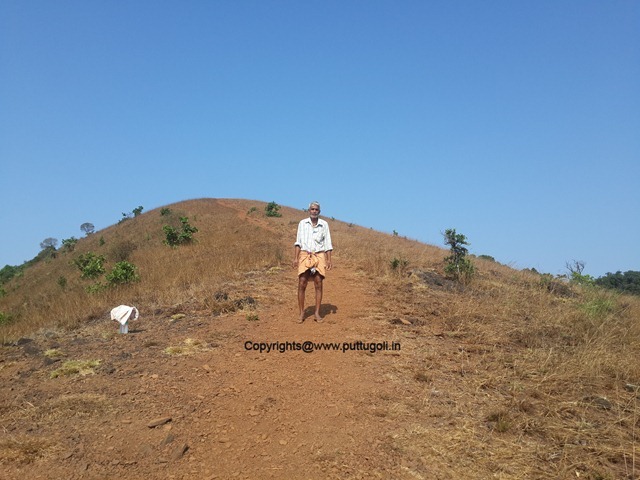 Once, we crossed the forest and reached the foot of the hill, it was very hot and were sweating like anything. We had to take some rest and also took some nice snaps then again started walking. 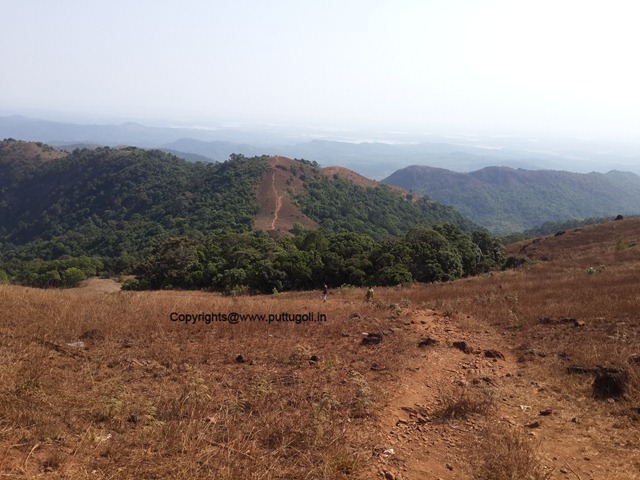 Above, the first picture shows the hills we climbed the walking way and the second one shows the Jeep road to Kodachadri. 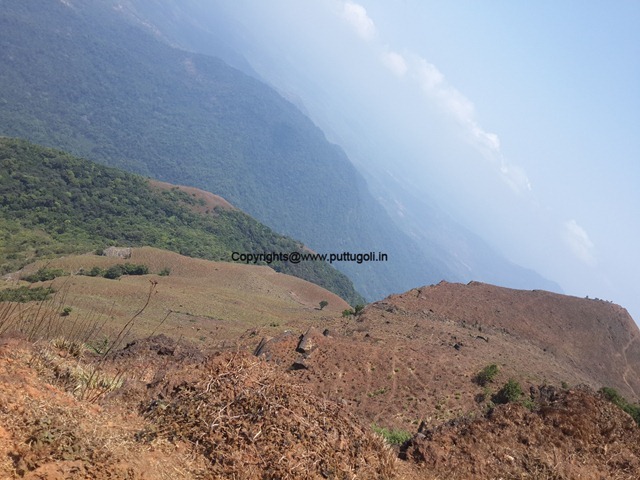 “Gaalipata” kannada movie shooting was done here on the Kodachadri hills. After reaching this spot we can then take the Jeep road to reach the “Mookambika” temple on the hilltop. This temple is the “Moola sthana” of Kollur Mookambika temple. There are few more temples, one of them is Bhadrakali. There is also a Kalyani (a small lake) and few houses of temple priests. 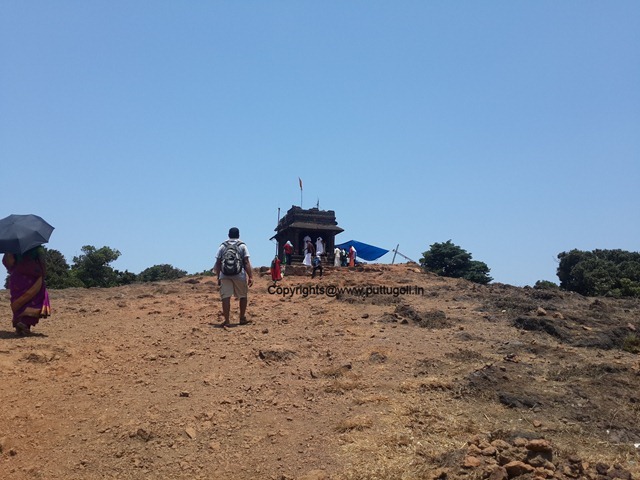 If we take the Jeep from Kollur or from the base of Kodachadri (Kattinahole), they will get us till this temple. From here we have to walk around 2 KM to reach the hilltop Shankaracharya temple. 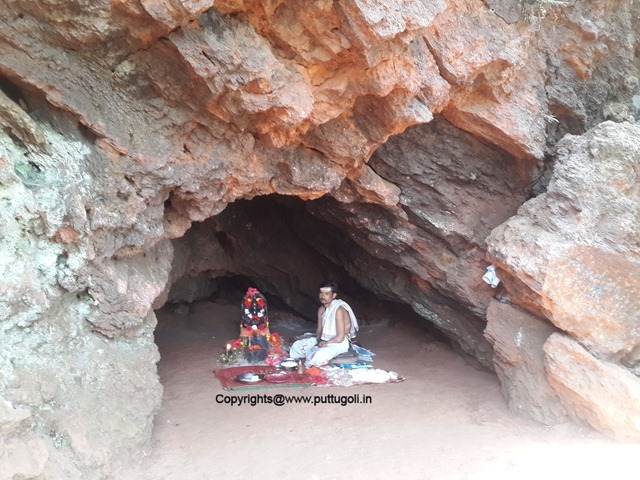 There is also a temple of Ganesha inside a small cave. Below are the pictures of both the temples. While coming down, we took the Jeep. The experience was extra ordinary. Before this, I never had gone by Jeep in such an extreme off-road condition. The road is completely worn out, big potholes on road, sometimes just rocks. But the Mahindra Jeep is just awesome for this road. I have to tell one incident while we were going down on the Jeep. 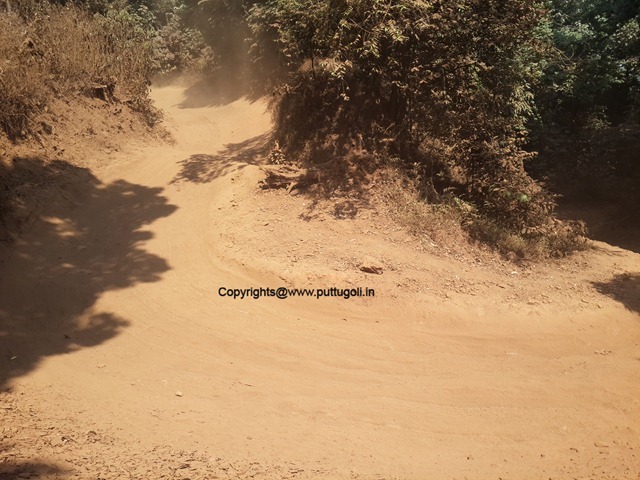 There was a hairpin curve, our jeep was climbing down and three more jeeps were coming up going to hilltop. There was no space to cross, hence our Jeep driver had to stop and take reverse. For me, who had never did off-roading it was amazing. Sometimes the jeep was going in just two wheels but did not topple. Overall, an awesome experience! !.